Saturday 15th June at 1-3pm. to sign her new book. Sue and her husband were first made aware of the Naval Marine Archive when their boat, Inia, was at Waupoos Marina. They felt that the ambiance at the Victory, would be an ideal setting for Sue's book signing. You will be able to learn about the choices and the life at sea of this adventurous couple. 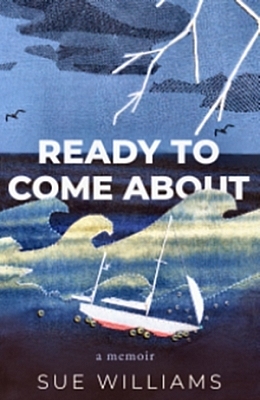 Ready to Come About is the story of a mother’s improbable adventure on the high seas and her profound journey within, through which she grew to believe that there is no gift more precious than the liberty to chart one’s own course, and that risk is a good thing … sometimes, at least. Ready to Come About by Sue Williams, published 2019 by Dundurn, ISBN 9781459743908, tpb, 304 pages. Please see our on-line catalogue and the author's page for more details.